Henry has been involved with the Chinese language and Traditional Chinese Medicine for more than fifteen years, an adventure that started with his move to China in 2001. He is a former President of the Michigan Association of Acupuncture and Oriental Medicine, and currently chairs the Legislative Committee. After becoming fluent in Chinese, Henry completed a 5-year post-graduate degree at the Hunan University of Traditional Chinese Medicine (HUTCM). While still a student he worked freelance as a medical translator and interpreter, and also translated TCM books and articles which have been published in China and England. During Henry’s clinical internship at the busy hospital affiliated with the HUTCM he worked in both inpatient and outpatient departments. Henry was responsible for new patient intake and acupuncture treatments for the 10-bed ICU unit in the Neurological Surgery department, with a estimated total of 900 treatments over 2 years. During that time he also assisted the department chief with treatments in the outpatient Acupuncture and Tuina departments. 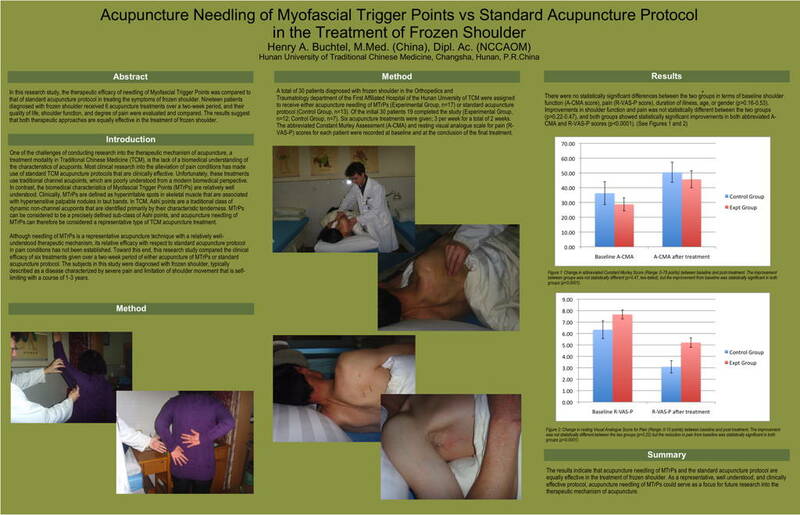 His Masters degree research, completed in 2011 and presented at the 2013 Society for Acupuncture Research (SAR) conference, focused on the clinical efficacy of trigger point acupuncture in the treatment of frozen shoulder. Henry has been fortunate to have the opportunity to study with several renowned teachers and practitioners in China, and is currently co-authoring a book for Eastland Press (USA) about his teacher Prof. Peng Jian’s clinical experience in herbal medicine. To visit Henry’s personal website, please go to www.dynamicpoints.com. Three years of pain after auto accident – virtually gone I was left with debilitating neuralgia in my face caused by an auto accident. For three years I tried all kinds of drugs to relieve the pain but nothing worked. When I stopped seeing you in January I was about 80% cured. I thought for sure that the pain would return, but I have good news I wanted to share with you. Over the span of this year the pain is virtually gone! I still can’t believe my good fortune of finding someone (and a treatment) that worked. Thanks to you and acupuncture I can now live a normal happy life! I am a critical care nurse, and I have been suffering from back pain for a couple of years. I have tried physical therapy and medication with no signs of relief. I decided to give acupuncture a try. Immediately after the first session with Henry I had some relief. I am now able to get back to my regular exercise program and only need to come in for treatment as needed. My quality of life has improved tremendously. I cannot thank Henry enough!! By the time I got to Henry and the Lotus Center, I had been in severe pain for about nine months. My life had been reduced to pain pills and bed rest. As a young active woman, this was devastating to me. I had seen numerous Doctors and Physical Therapists. They were recommending surgery on my back as the next solution. Fortunately, one of the wonderful Physical Therapists recommended I give acupuncture a try and specifically referred me to Henry Buchtel. After the first session I was pain free for several days which was the first time in nine months that had happened. I continued on with Henry’s treatment growing healthier every week. I am now back to my yoga practice three days per week. I can vacuum, wash dishes and even shovel snow pain free. Henry and acupuncture have helped to restore my life and health. I will be forever grateful. I had this painful itching sensation on my right forearm that was mistakenly diagnosed as a shingles outbreak. Although being treated with Gabapentin and all sorts of ointments there was no improvement and the pain was at times excruciating. This condition had already lasted for 3 months. I started acupuncture with Henry and already after the first treatment things got definitely better. After further visits I could reduce the medication and stop it altogether. A clear diagnosis of my problem could never be made but I know where to turn in case it would flare up again. For me, the treatment and its success were just wondrous. I began acupuncture treatment in January of 2013 as an alternative to treating my generalized anxiety disorder with medication. Prior to beginning acupuncture with Henry Buchtel I was experiencing frequent panic attacks, irritability caused by stress and anxiety and suffering from OCD related symptoms.Henry created a program of treatment to help reduce my symptoms and help my body and mind better deal with the condition. Having never experienced acupuncture before, Henry was incredibly helpful in explaining the procedure and the theory behind acupuncture and putting me at ease with the process. After just a few treatments, I felt a definite reduction in my anxiety symptoms. In addition to a decrease in my actual panic attacks, other symptoms of my stress including chronic nosebleeds were dramatically reduced. At the beginning of every session, Henry made sure to check in with me and discuss what my physical and mental reaction had been the last acupuncture session. It was very reassuring to know that at each meeting he would reassess my condition and adjust my treatment according to how I was feeling that week. Since beginning my experience with acupuncture I have found my work life productivity has improved due to the decrease in my level of anxiety, my ability to concentrate has increased and my irritability has significantly decreased. In my personal life I have found that I spend considerably less time worried and panicky, which allows me more time to simply live my life. I am grateful that acupuncture and Henry as my practitioner have managed to effect such a positive change in my life. Henry is a caring acupuncturist. He took time to get to know my daily habits and made suggestions of simple changes I could make to my lifestyle based on his training. Henry made sure I was always was comfortable during treatments. I saw him for a couple of months leading up to my IVF treatment which ended up being successful. I’m very glad I made the drive up from Toledo once a week and I would do it all over again. I’m writing about Henry’s acupressure, acupuncture, & herbal treatment of my 9 year old daughter, who had been improperly diagnosed and treated by a psychiatrist last year. It was our first experience with acupuncture, and from the day we met Henry, he made my daughter and me feel very comfortable, both with sharing our experience and with treatment. He has a very gentle, reassuring energy and is very professional and respectful to my daughter and me. My daughter enjoys going for acupuncture now, especially because Henry has been able to modify the treatment to use transcutaneous electrical nerve stimulation instead of actual needles. He explains everything to my daughter fully, and has always respectfully listened to her concerns. Henry responds to her reactions to therapy, modifying as needed. We have seen a much happier side to my daughter this past 8 months since she has been seeing Henry, which followed a negative, whirlwind of an experience with traditional Western doctors. We value the therapeutic time that we have with Henry, as well as his expertise in the field of Traditional Chinese Medicine. We highly recommend him as a practitioner and healer.